The Lift and Hide Bookcase Storage Chest gives you a way to eliminate the appearance of clutter from a child's bedroom or play area. It offers an abundance of space, not limited to toys, but also useful for books, games, puzzles and decorative items. It has two open shelves and a large box on the bottom with an attached lid. 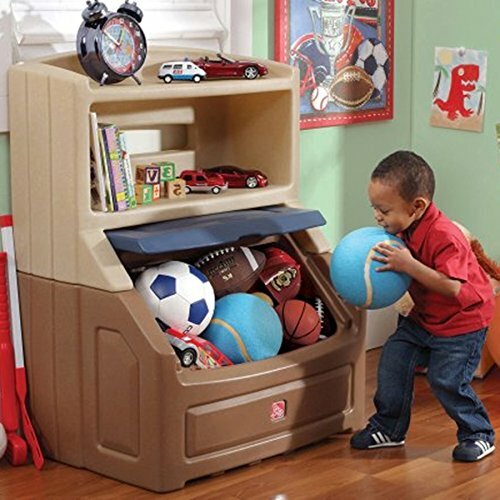 The top part of this kid's storage chest includes a rack ideal for arranging accessories. Below that is a shelf where books up to 10" in height fit vertically. The final section, a large toy chest, offers plenty of room for keeping their favorite things in one central location, closed off from view. It is made of sturdy materials in a kid-friendly design with no sharp edges or heavy lids to open and close. With this attractive Lift and Hide Bookcase Storage Chest unit you create a housed containment center that a child is sure to enjoy. Over 5-1/2 cubic feet of storage. Eliminates the appearance of clutter. Includes 3 areas of storage space. Ideal for a child's bedroom or play area. Top part includes a rack for displaying toys and collectibles. Designed with a back panel to prevent items from falling behind the bookcase.